Following the successful double release of "I Remember Bu: Alive Vol. 4" from The Gen-Next Big Band and "Inward Venture" from Aggregate Prime, iconic drummer, bandleader and Berklee professor Ralph Peterson Jr. is now thrilled to continue his restless touring schedule with the Messenger Legacy ensemble. 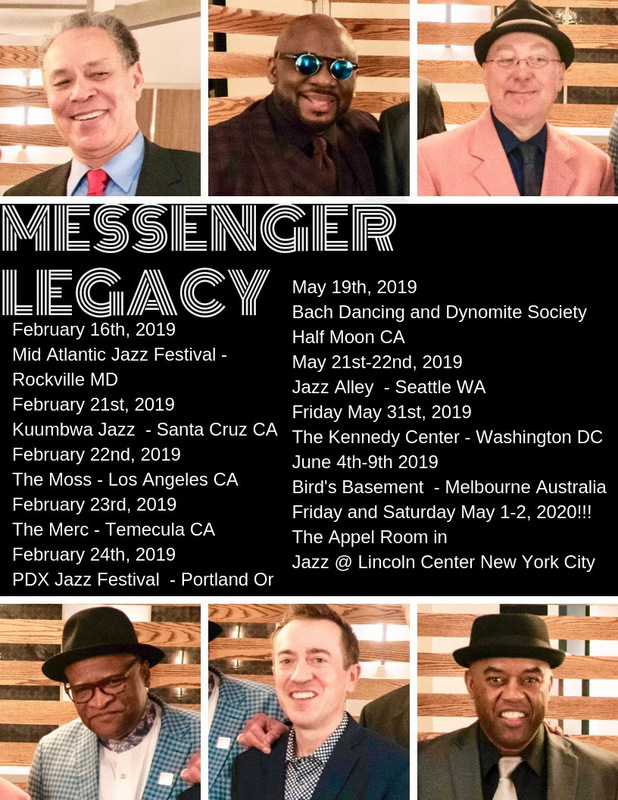 Due to release a new album in May 2019 on Peterson’s Onyx Productions, The Messenger Legacy band -- featuring Bobby Watson, Essiet Essiet, Geoff Keezer, Brian Lynch and Bill Pierce -- have announced dates from the beginning of 2019 through 2020! The elite line-up of Jazz Messenger alumni will perform in Maryland, California, Oregon, Washington, DC, New York City, Australia and China. This upcoming new album is the final piece of the Onyx Productions trilogy which paid homage to and coincided with Art Blakey’s 99th and centennial birthdays. As the last drummer chosen by Blakey to play by his side in the Jazz Messengers, Peterson has a unique responsibility to carry on the Messenger torch and tradition. The current Messenger Legacy configuration has deep roots: Bill Pierce and Bobby Watson were members of the Jazz Messengers when Peterson first sat in with the group and the final Jazz Messengers arrangement featured Peterson with Essiet Essiet, Geoff Keezer and Brian Lynch. Commemorating Art Blakey’s 99th birthday, the Messenger Legacy Band performed at Scullers Jazz Club on this past October 11th. The band continued the celebrations with performances through the next two nights at the Side Door in Old Lyme Connecticut. This performance was recorded and will now be heard for the very time on this new Spring album, which will coincide with a special performance at the Kennedy Center on May 31st. After making their professional debut at Scullers in Boston in late 2017, the Peterson-led Gen-Next Big Band released "I Remember Bu: Alive Vol. 4 at Scullers," featuring fellow Art Blakey alum Donald Harrison on October 4th, 2018. Following in the Jazz Messenger tradition of mentorship, the GenNext Big Band features an exciting lineup of some of Berklee College of Music’s brightest young musicians and employs Blakey’s signature two-drummer format. George Kanzler at New York City Jazz Record made an apropos summary of this recording when he wrote: "It all makes for an exciting, exhilarating and exhaustively entertaining big band workout." Wasting no time, The GenNext Big Band returned to the studio this past weekend to record a second album at Avatar Studios. This project will feature Mingus Big Band trombonist Frank Lacy as a very special guest soloist. Onyx Productions’ second release of 2018 was "Inward Venture: Alive Vol. 5," released on October 17th with Peterson’s seminal group Aggregate Prime. This quintet features a who’s-who of modern jazz masters including Gary Thomas on tenor saxophone and flute, Mark Whitfield on guitar, Davis Whitfield on piano, Curtis Lundy on bass and Peterson on drums. A follow up to the group’s 2016 debut "Dream Deferred," "Inward Venture" was recorded at the Side Door in Old Lyme, Connecticut and showcases the exciting group at their most adventurous. “I am very excited about the progress of this band and this recording shows the immense potential and kinetic energy,” says Peterson. Amongst reviews from New York City Jazz Record and Midwest Record, Nate Chinen at WBGO wrote, "the album — Inward Venture: Alive Vol. 5 at the Side Door (Onyx Music) — has all of the brash kinetic energy you’d expect from such an assemblage." Both of these releases received two fantastic features from Downbeat and Jazziz. Peterson’s prolific recording career began in 1985 with the fabled Blue Note label, with whose house band, OTB (Out of the Blue) he performed as a drummer. He released six Blue Note albums as a leader of different combos, including the “Fo’tet," a quartet whose members have at various times included clarinetist Don Byron, saxophonist Steve Wilson, bassist Belden Bullock and vibraphonist Bryan Carrott. To date, Peterson has released over 20 albums as a leader.